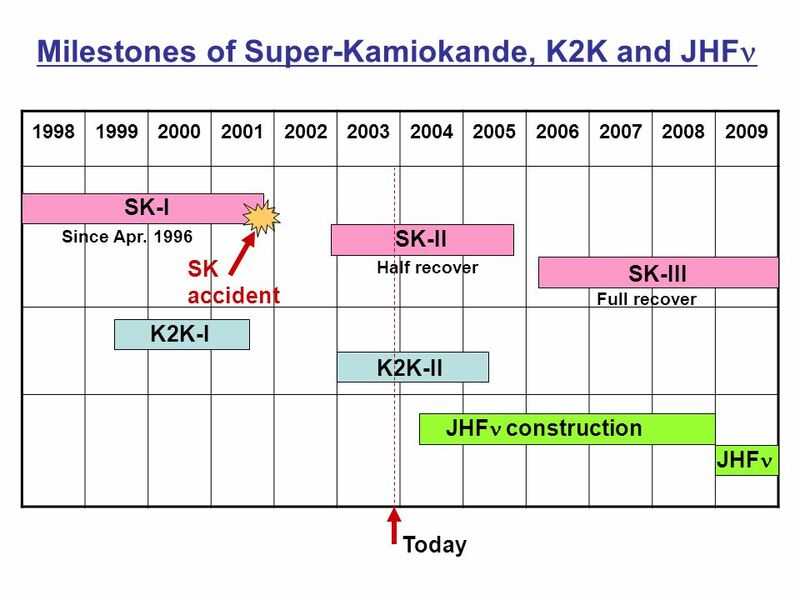 Status of Super-Kamiokande, K2K and JHF ACFA LC Yuichi Oyama (KEK) for Super-Kamiokande collaboration, K2K collaboration and JHF collaboration. 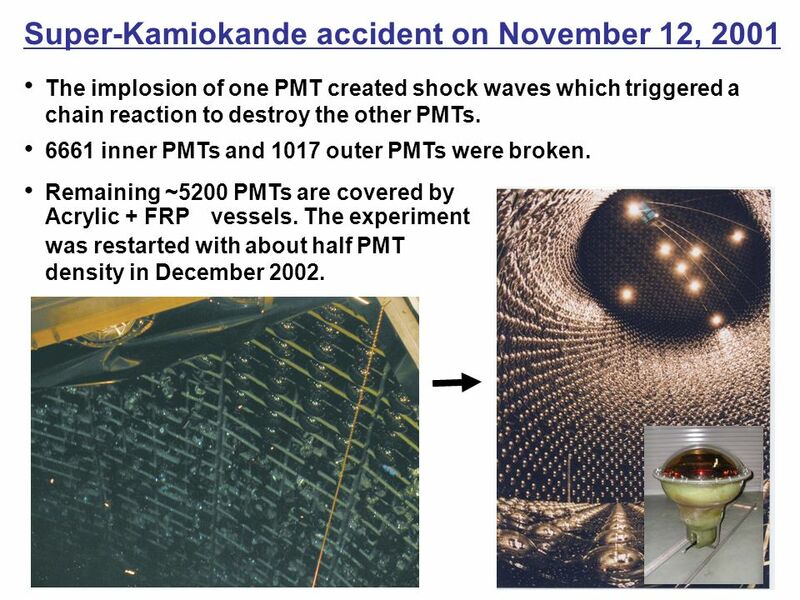 3 Super-Kamiokande accident on November 12, 2001 ● 6661 inner PMTs and 1017 outer PMTs were broken. ● The implosion of one PMT created shock waves which triggered a chain reaction to destroy the other PMTs. ● Remaining ~5200 PMTs are covered by Acrylic + FRP vessels. The experiment was restarted with about half PMT density in December 2002. 4 Present status of Super-Kamiokande ● Enjoying interesting topics of SK-I data: The experiment is successfully in operation ! 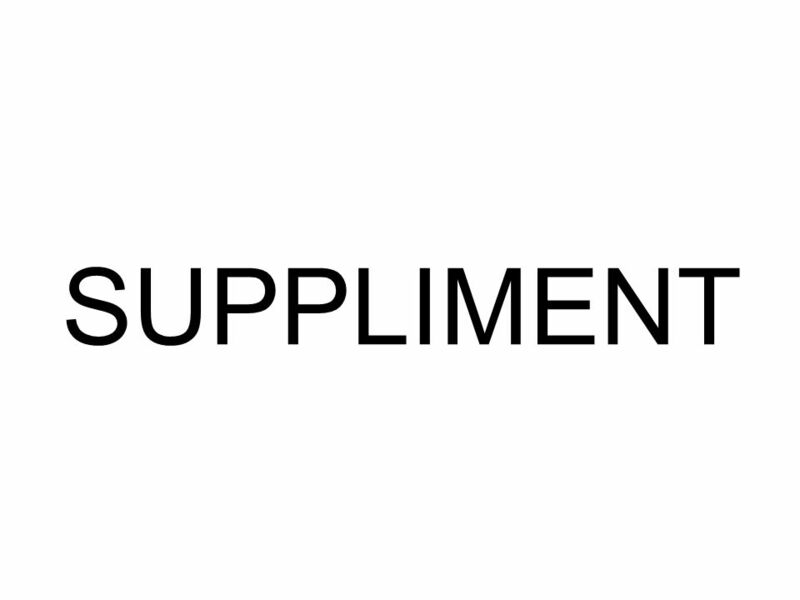  -ray burst, relic supernova neutrino, e from the Sun, ● Calibration and modification of analysis tools for SK-II are in progress. 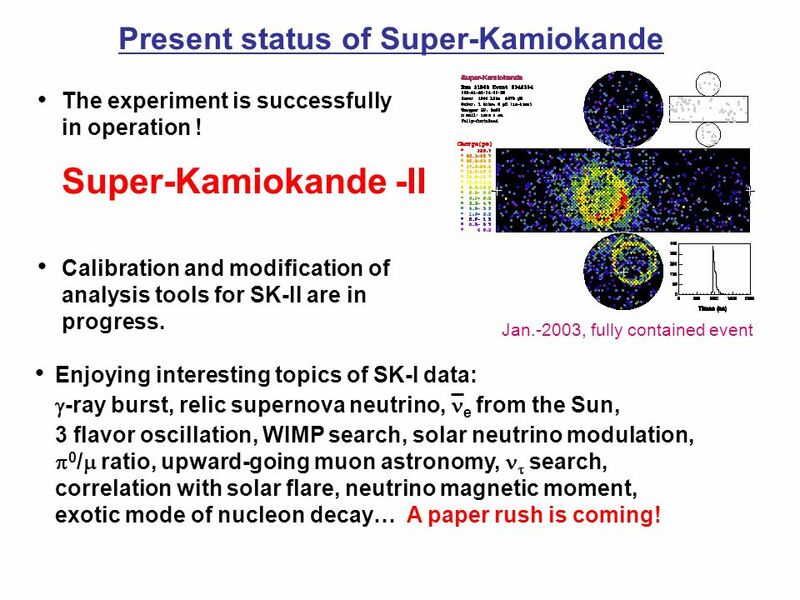 ● Super-Kamiokande -II Jan.-2003, fully contained event 3 flavor oscillation, WIMP search, solar neutrino modulation,  0 /  ratio, upward-going muon astronomy,    search, correlation with solar flare, neutrino magnetic moment, exotic mode of nucleon decay… A paper rush is coming! 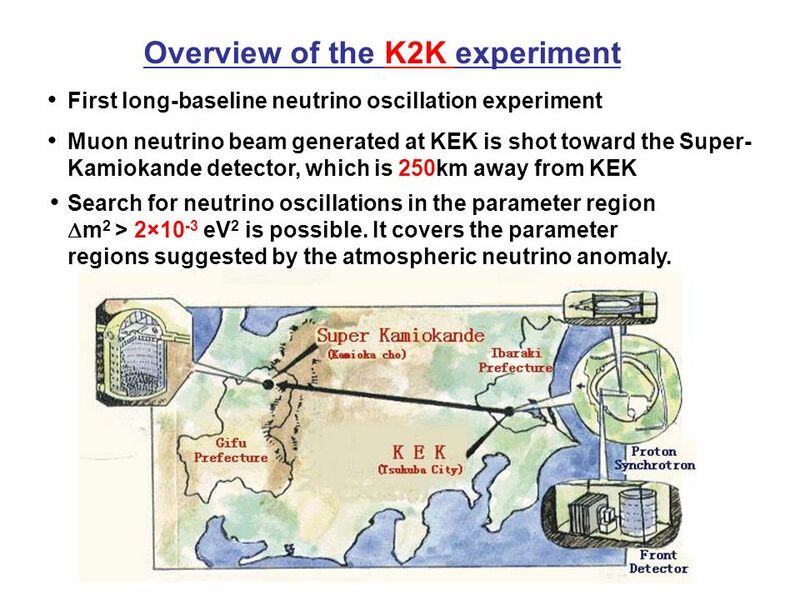 5 Overview of the K2K experiment ● ● ● First long-baseline neutrino oscillation experiment Muon neutrino beam generated at KEK is shot toward the Super- Kamiokande detector, which is 250km away from KEK Search for neutrino oscillations in the parameter region  m 2 > 2×10 -3 eV 2 is possible. It covers the parameter regions suggested by the atmospheric neutrino anomaly. 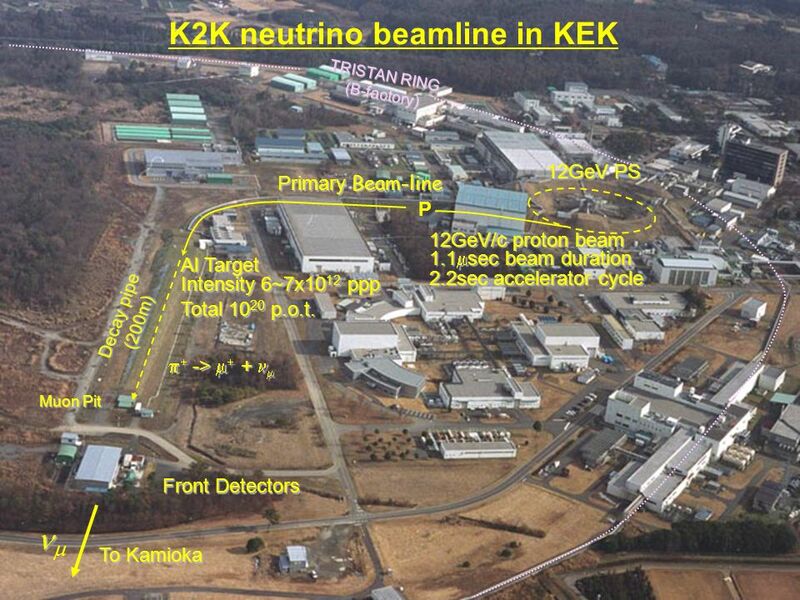 6 P Primary Beam-line 12GeV/c proton beam Al Target Front Detectors  Decay pipe (200m) TRISTAN RING (B-factory) Muon Pit K2K neutrino beamline in KEK 1.1  sec beam duration 2.2sec accelerator cycle 12GeV PS Intensity 6~7x10 12 ppp To Kamioka   ->   +  Total 10 20 p.o.t. 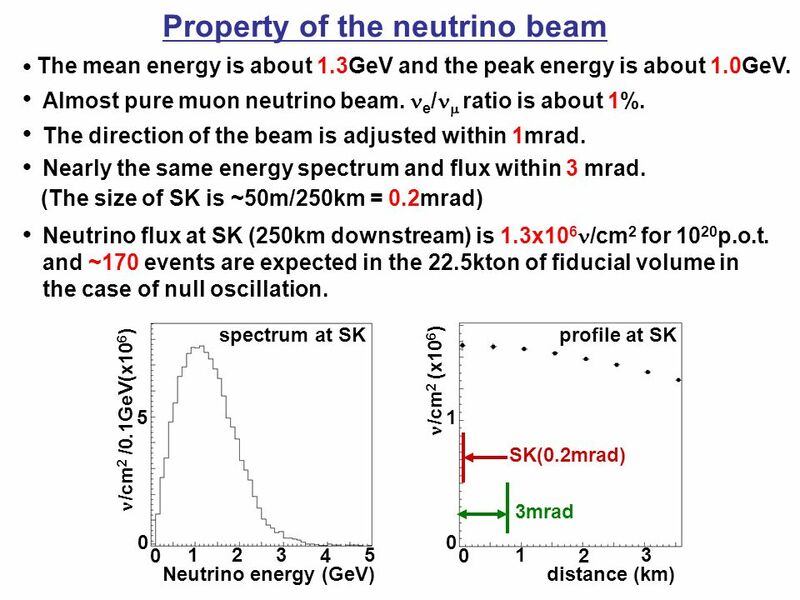 7 profile at SK 0 0 1 31 2 3mrad /cm 2 (x10 6 ) distance (km) SK(0.2mrad) spectrum at SK 0 123 4 5 Neutrino energy (GeV) /cm 2 /0.1GeV(x10 6 ) 0 5 Property of the neutrino beam ● The mean energy is about 1.3GeV and the peak energy is about 1.0GeV. ● Almost pure muon neutrino beam. e /  ratio is about 1%. ● Nearly the same energy spectrum and flux within 3 mrad. 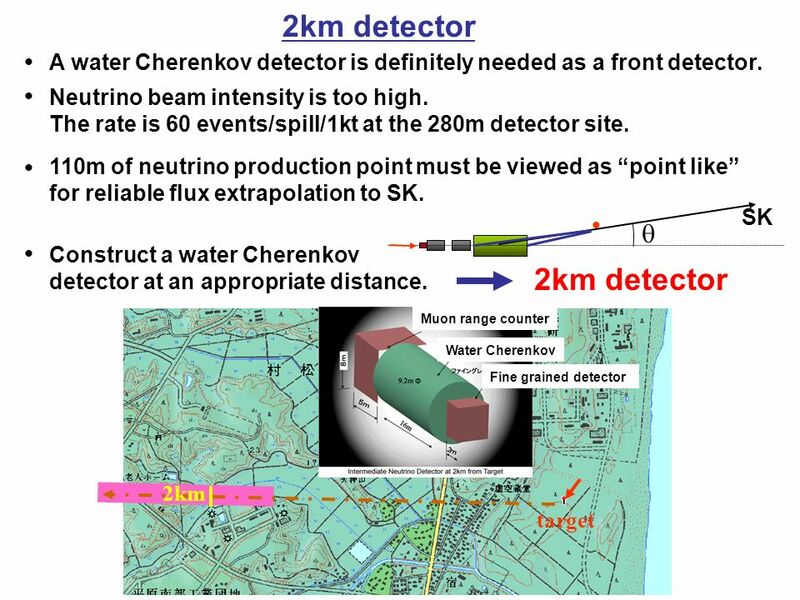 (The size of SK is ~50m/250km = 0.2mrad) ● Neutrino flux at SK (250km downstream) is 1.3x10 6 /cm 2 for 10 20 p.o.t. and ~170 events are expected in the 22.5kton of fiducial volume in the case of null oscillation. 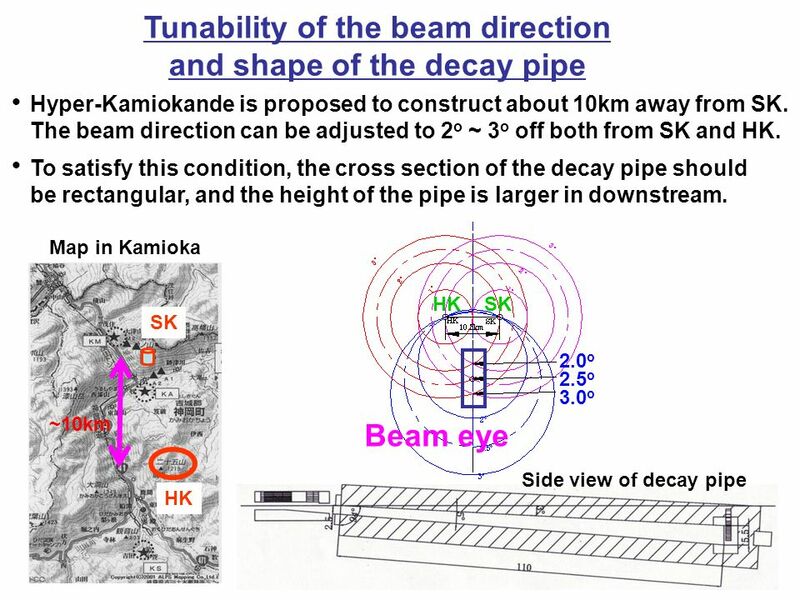 ● The direction of the beam is adjusted within 1mrad. 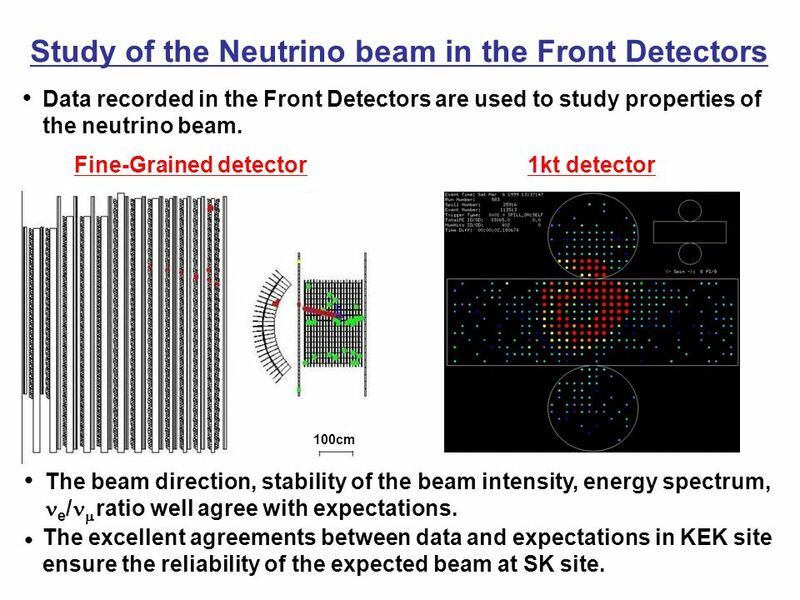 9 Study of the Neutrino beam in the Front Detectors 100cm 1kt detectorFine-Grained detector ● The excellent agreements between data and expectations in KEK site ensure the reliability of the expected beam at SK site. 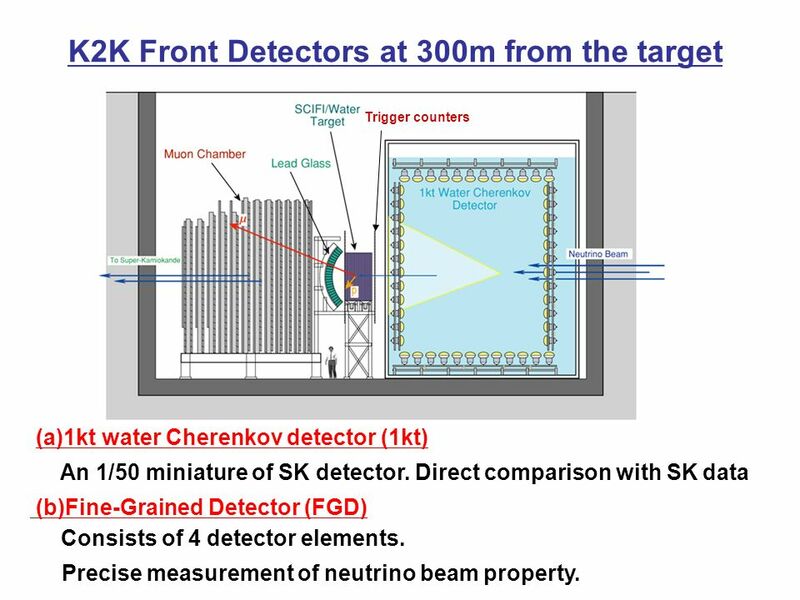 ● Data recorded in the Front Detectors are used to study properties of the neutrino beam. 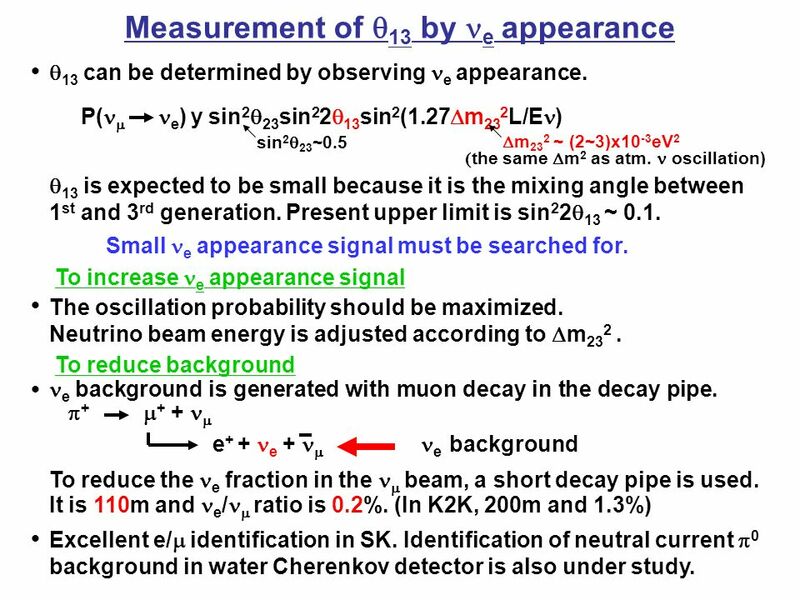 ● The beam direction, stability of the beam intensity, energy spectrum, e /  ratio well agree with expectations. 12 +6.2 -5.4 E (GeV) Number of events data  m=2.8x10 -3 eV 2 no oscillation Number of neutrino events is considerably smaller than the expectation. 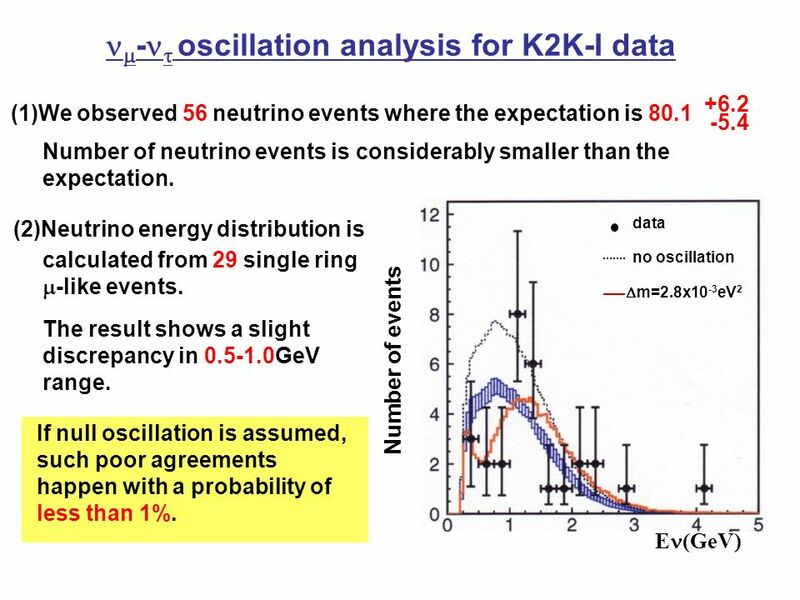 (1)We observed 56 neutrino events where the expectation is 80.1  (2)Neutrino energy distribution is  -   oscillation analysis for K2K-I data calculated from 29 single ring  -like events. The result shows a slight discrepancy in 0.5-1.0GeV range. If null oscillation is assumed, such poor agreements happen with a probability of less than 1%. 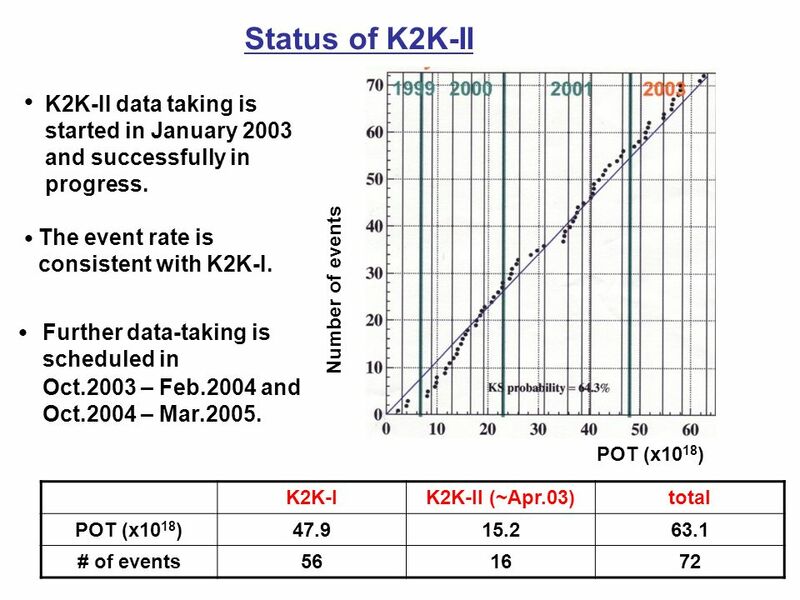 14 Status of K2K-II ● K2K-II data taking is started in January 2003 and successfully in progress. K2K-IK2K-II (~Apr.03)total POT (x10 18 )47.915.263.1 # of events561672 The event rate is consistent with K2K-I. Number of events POT (x10 18 ) ● Further data-taking is scheduled in ● Oct.2003 – Feb.2004 and Oct.2004 – Mar.2005. 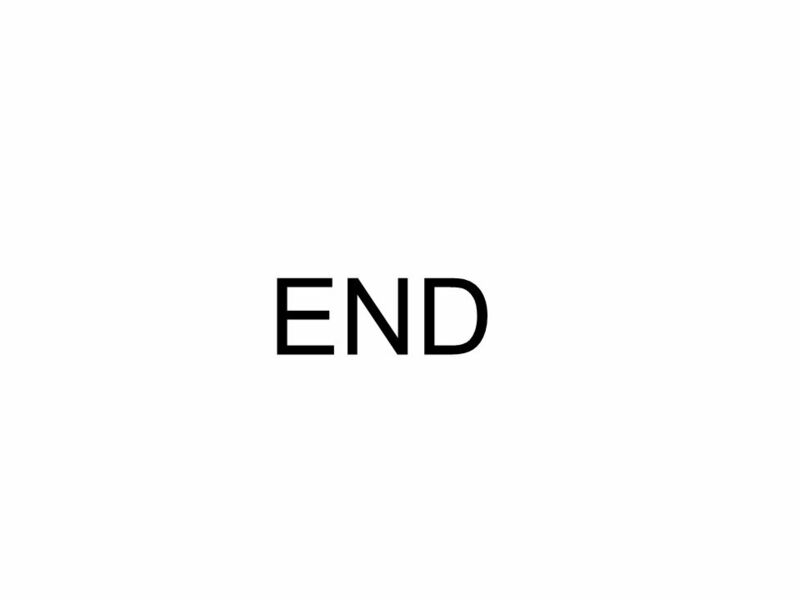 16 The name of the entire project. It includes JAERI : Japan Atomic Energy Research Institute. Tokai : the name of the village where JAERI is located. 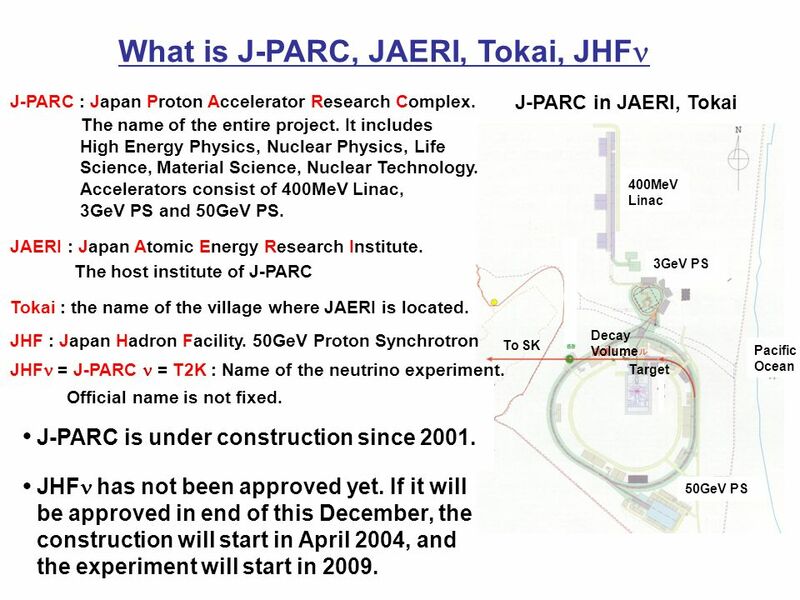 What is J-PARC, JAERI, Tokai, JHF J-PARC : Japan Proton Accelerator Research Complex. The host institute of J-PARC J-PARC in JAERI, Tokai To SK 400MeV Linac 3GeV PS 50GeV PS Pacific Ocean Decay Volume Target High Energy Physics, Nuclear Physics, Life Science, Material Science, Nuclear Technology. Accelerators consist of 400MeV Linac, 3GeV PS and 50GeV PS. ● J-PARC is under construction since 2001. ● JHF has not been approved yet. If it will be approved in end of this December, the construction will start in April 2004, and the experiment will start in 2009. JHF : Japan Hadron Facility. 50GeV Proton Synchrotron Official name is not fixed. 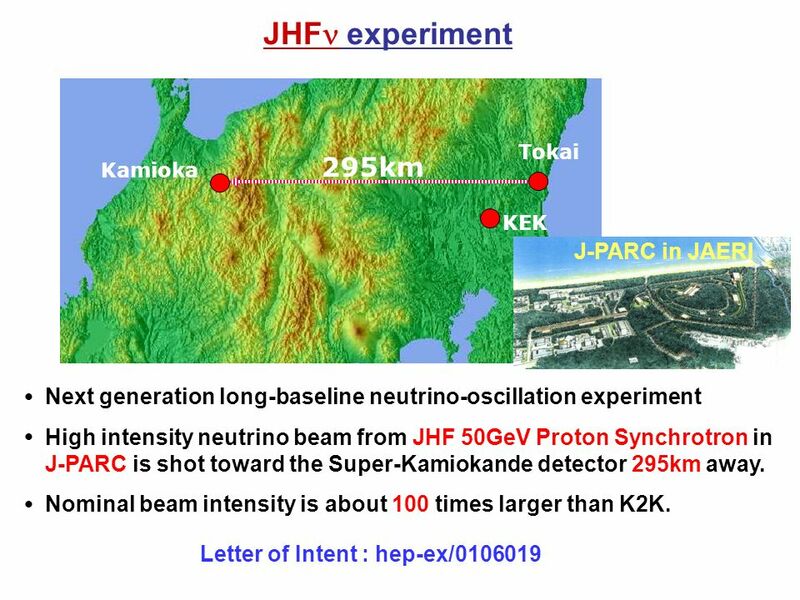 JHF = J-PARC = T2K : Name of the neutrino experiment. 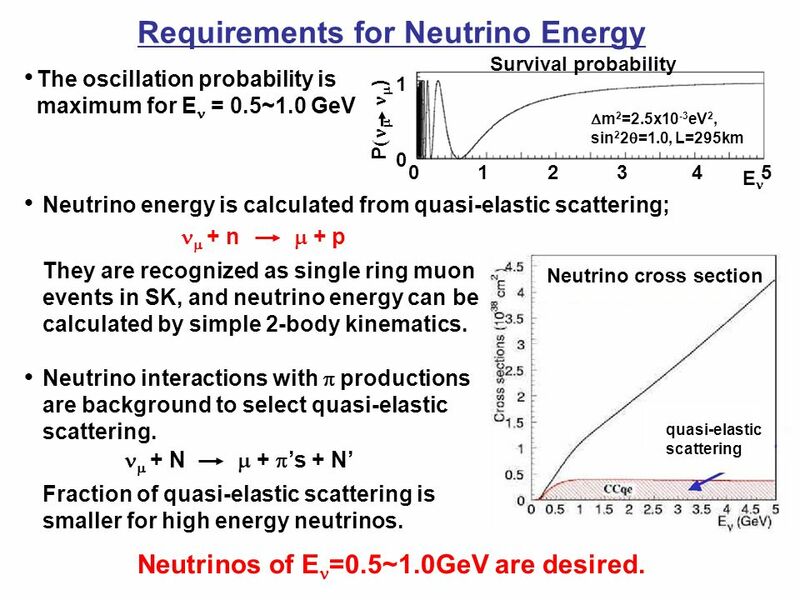 20 Neutrino cross section quasi-elastic scattering Requirements for Neutrino Energy  + n  + p Neutrino energy is calculated from quasi-elastic scattering; ●  + N  +  ’s + N’ The oscillation probability is maximum for E = 0.5~1.0 GeV ● 012345 0 1 E P     )  m 2 =2.5x10 -3 eV 2, sin 2 2  =1.0, L=295km Survival probability Neutrino interactions with  productions are background to select quasi-elastic scattering. They are recognized as single ring muon events in SK, and neutrino energy can be calculated by simple 2-body kinematics. Neutrinos of E =0.5~1.0GeV are desired. ● Fraction of quasi-elastic scattering is smaller for high energy neutrinos. 21 1° 0° 2° 3° Off Axis Angle2.02.12.43.0 E peak(GeV)0.7820.7560.6560.520  m 23 2 (x10 -3 eV 2 ) 3.283.172.752.18  beamline SK ● ● Off Axis beam The center of the beam direction is adjusted to be 2 o ~ 3 o off from the SK direction. 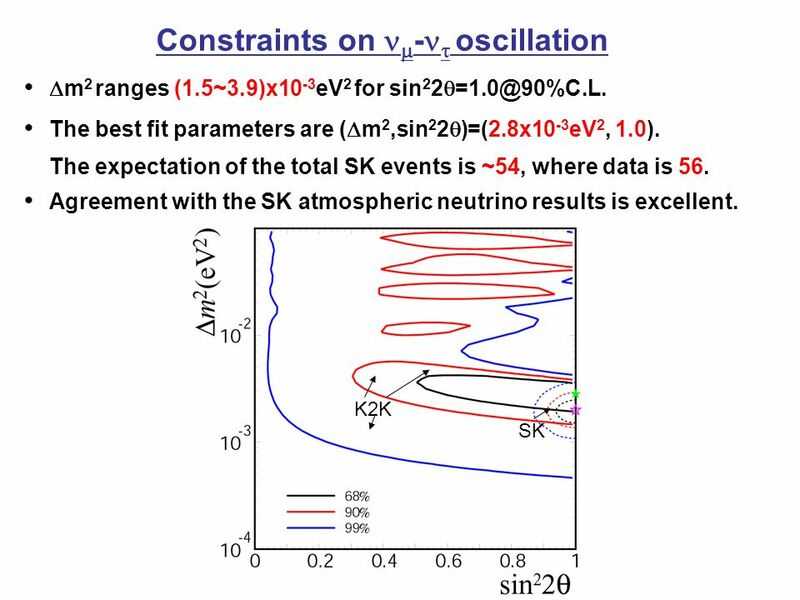 Although neutrino intensity at SK is lower, the peak energy is low and high energy neutrinos are suppressed. We want to adjust the peak energy to the oscillation maximum, which has still large uncertainty. Keep a tunability of the beam direction and wait other experiments. 24 Summary ● After the recovery in December 2002, Super-Kamiokande-II is successfully in operation. ● Super-Kamiokande K2K ● Analysis based on 1999-2001 data (47.9x10 18 p.o.t.) was published. Probability of null oscillation is less than 1%  m 2 ranges (1.5~3.9)x10 -3 eV 2 for sin 2 2  =1.0@90%C.L. 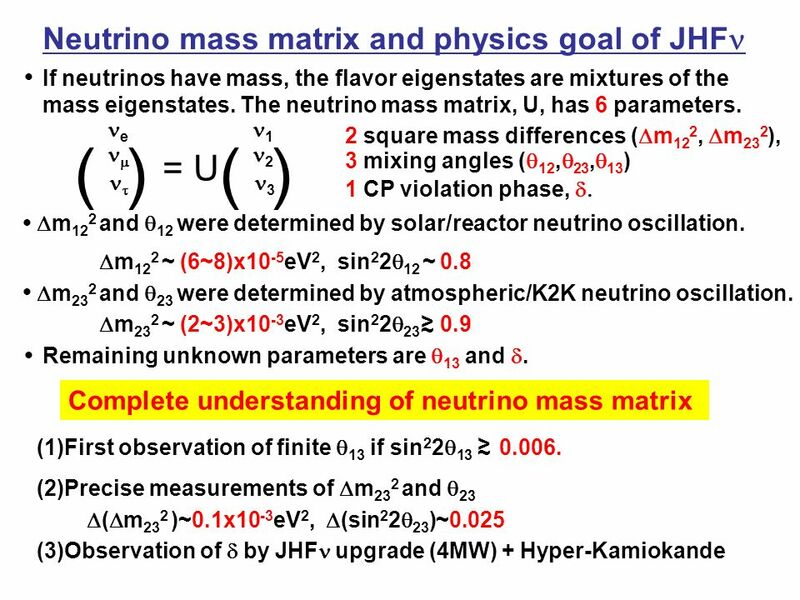 JHF ● Complete understanding of neutrino mass matrix ● Keywords: ~100 x K2K e appearance for  13 measurement 2km detectorOff-axis beam ● Hopefully, start in 2009. The experiment has taken data corresponding to more than 70x10 18 p.o.t. Data-taking will continue at least until March 2005. 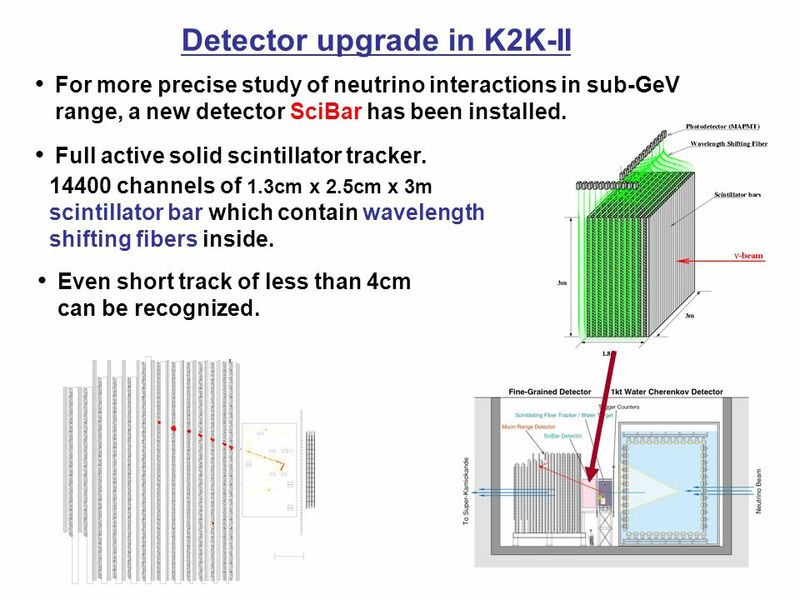 28 Detector upgrade in K2K-II ● For more precise study of neutrino interactions in sub-GeV range, a new detector SciBar has been installed. ● Full active solid scintillator tracker. 14400 channels of 1.3cm x 2.5cm x 3m scintillator bar which contain wavelength shifting fibers inside. ● Even short track of less than 4cm can be recognized. 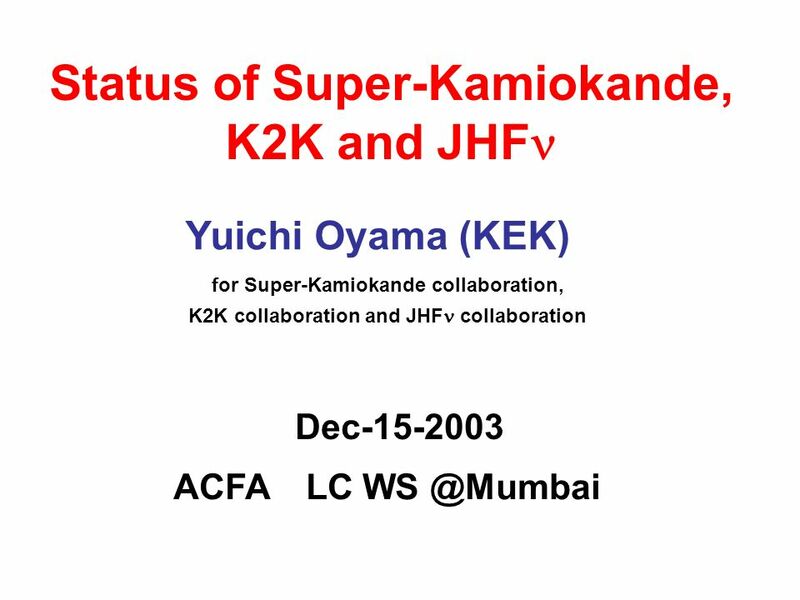 Download ppt "Status of Super-Kamiokande, K2K and JHF ACFA LC Yuichi Oyama (KEK) for Super-Kamiokande collaboration, K2K collaboration and JHF collaboration." 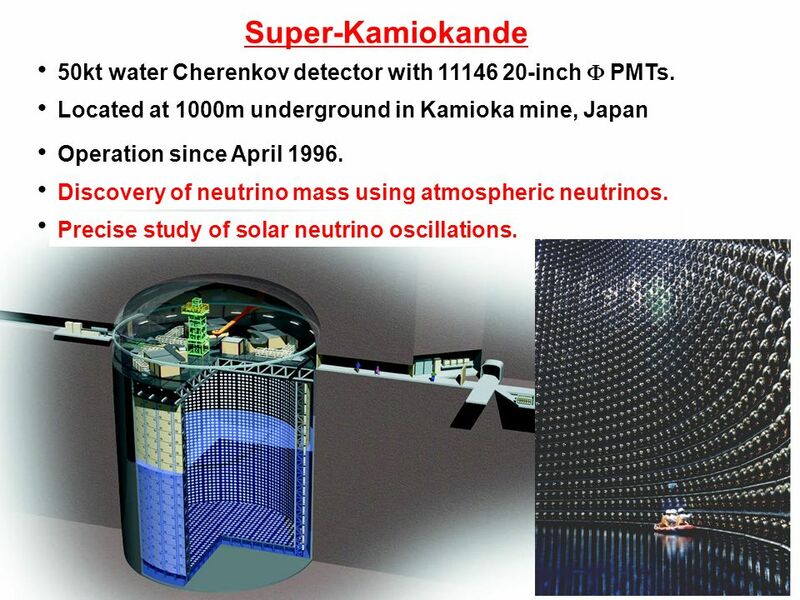 11-September-2005 C2CR2005, Prague 1 Super-Kamiokande Atmospheric Neutrino Results Kimihiro Okumura ICRR Univ. of Tokyo ( 11-September-2005. Super-Kamiokande Introduction Contained events and upward muons Updated results Oscillation analysis with a 3D flux Multi-ring events  0 /  ratio 3 decay. G. Sullivan - Princeton - Mar 2002 What Have We Learned from Super-K? –Before Super-K –SK-I ( ) Atmospheric Solar –SNO & SK-I Active solar –SK. T2K neutrino experiment at JPARC Approved since 2003, first beam in April Priorities : 1. search for, and measurement of,   e appearance  sin. Sinergia strategy meeting of Swiss neutrino groups Mark A. Rayner – Université de Genève 10 th July 2014, Bern Hyper-Kamiokande 1 – 2 km detector Hyper-Kamiokande. How to Build a Neutrino Oscillations Detector - Why MINOS is like it is! Alfons Weber March 2005. Neutrino-CH 19 October 2006 Alain Blondel HARP and K2K 1. The K2K experiments 2. beam related uncertainties 3. HARP and results 4. K2K and results 5. conclusions. CHIPP 2 October 2006 Alain Blondel HARP-K2K-T2K 1. 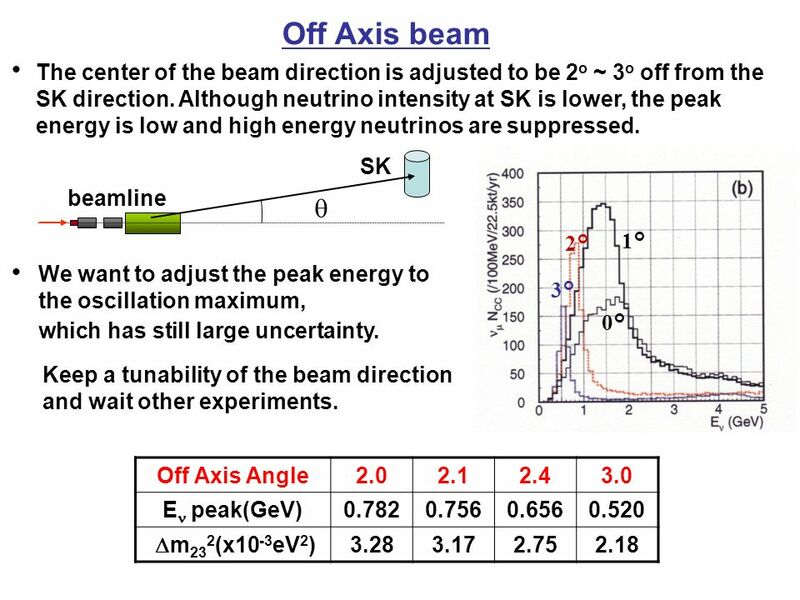 The K2K and T2K experiments 2. beam related uncertainties 3. HARP and results 4. K2K and results 5. Reactor & Accelerator Thanks to Bob McKeown for many of the slides. 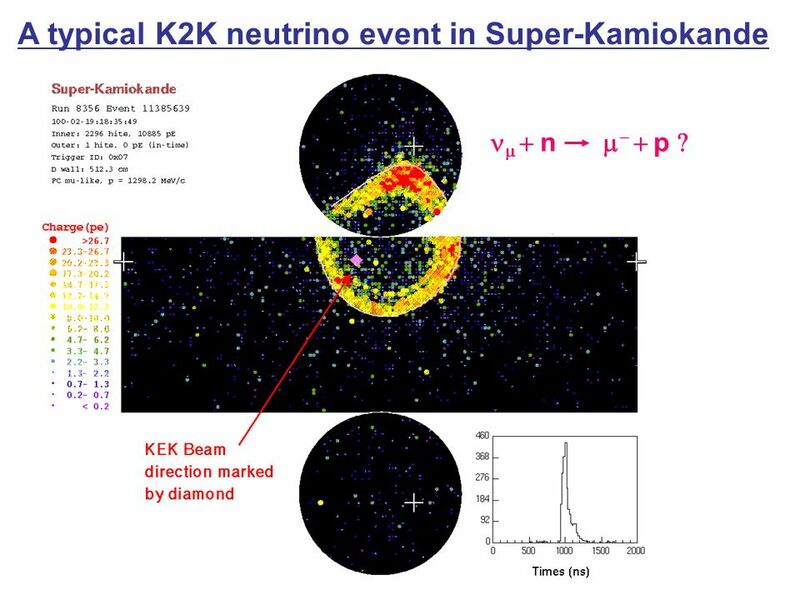 1 Evidence of Neutrino Oscillation from Super-Kamiokande and K2K Neutrino physics at Super-Kamiokande –Detector overview –Atmospheric neutrinos –Solar. T2K experiment at J-PARC Epiphany 2010D. Kiełczewska1 For T2K Collaboration Danuta Kiełczewska Warsaw University & Sołtan Institute for Nuclear Studies. 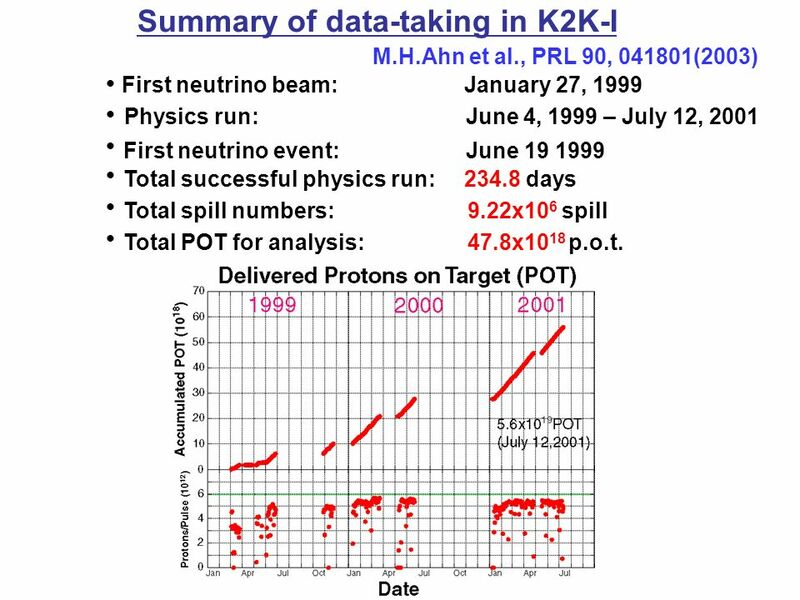 New results from K2K Makoto Yoshida (IPNS, KEK) for the K2K collaboration NuFACT02, July 4, 2002 London, UK. 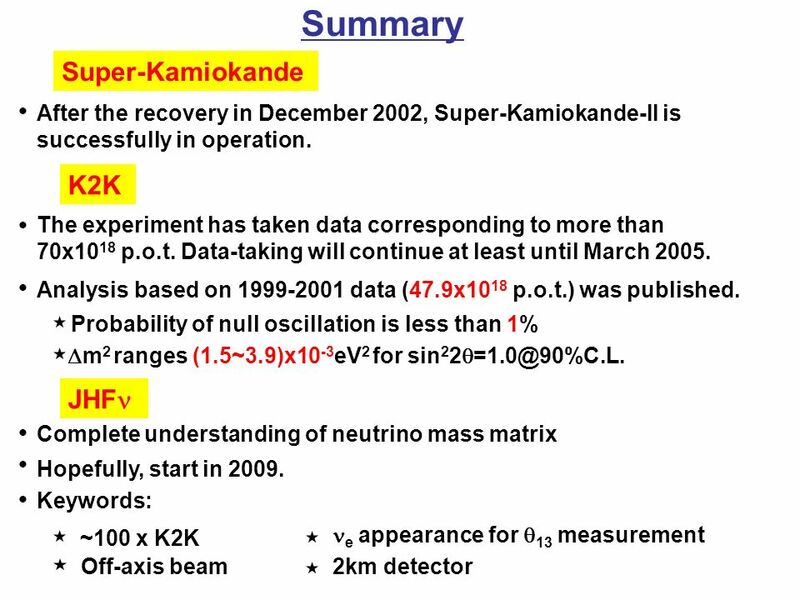 Super-Kamiokande – Neutrinos from MeV to TeV Mark Vagins University of California, Irvine EPS/HEP Lisbon July 22, 2005. 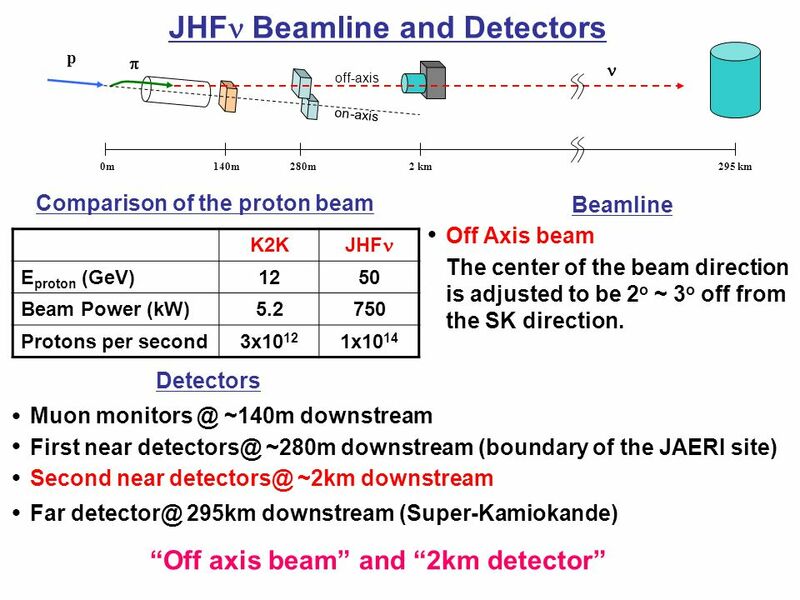 JHF2K neutrino beam line A. K. Ichikawa KEK 2002/7/2 Overview Primary Proton beamline Target Decay Volume Strategy to change peak energy. 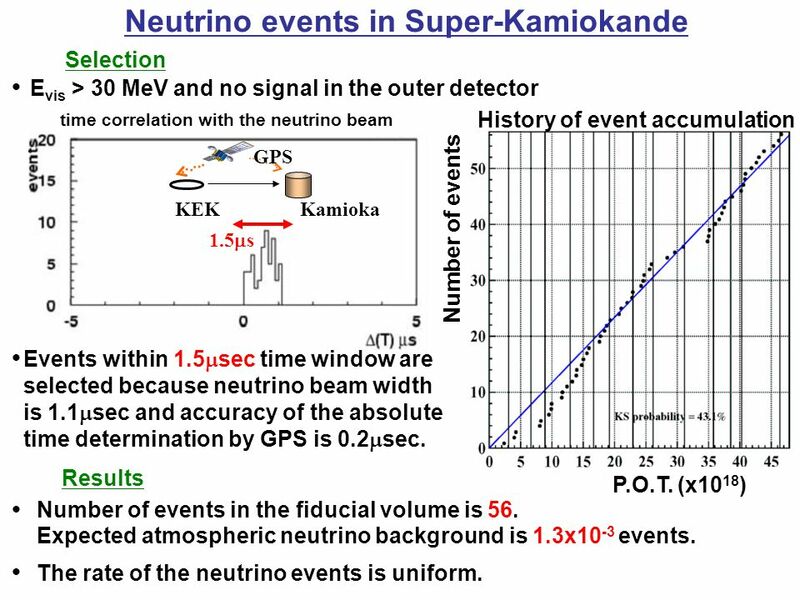 1 Super-Kamiokande atmospheric neutrinos Results from SK-I atmospheric neutrino analysis including treatment of systematic errors Sensitivity study based. K. Nakamura NNN05, Aussois, April Overview of Hyper-Kamiokande R&D Kenzo NAKAMURA KEK April 7-9, 2005 NNN05 Aussois, Savoie, France. J-PARC: Where is it? J-PARC (Japan Proton Accelerator Research Complex) Tokai, Japan 50 GeV Synchrotron (15  A) 400 MeV Linac (350m) 3 GeV Synchrotron. Long Baseline Experiments at Fermilab Maury Goodman.